The drawing that is the subject of the photograph is a finely detailed and rendered illustration of the Whitbread engine. At the time the photograph was taken, the engine was known to be significant as an early example of the rotative engines made by the ground-breaking firm of Boulton and Watt. 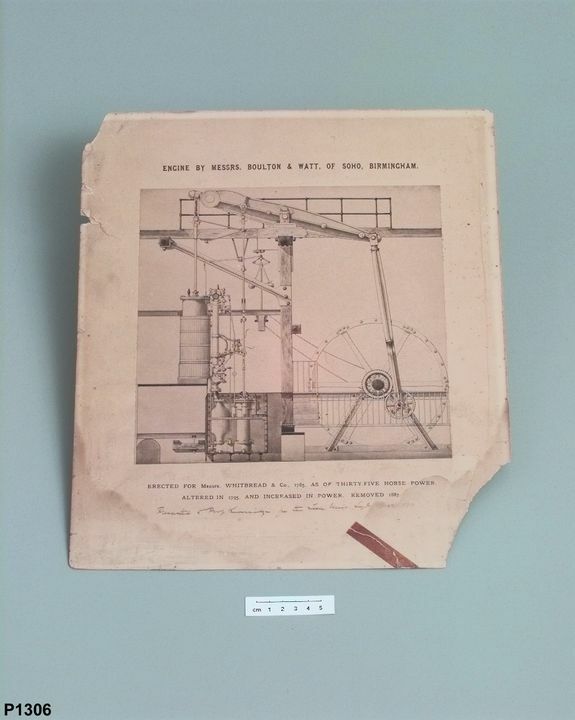 A photograph reproduction showing a drawing of the beam engine made by Boulton and Watt for Whitbread and Company in London, England. The drawing is a finely detailed rendered image of the engine that is now in this Museum's collection. It shows the engine in its final form at the brewery, with some detail of the supporting timbers and safety railings. It also includes a cutaway view of the tank, revealing the separate condenser, air pump, hot well and dashpots. The photograph is mounted on cardboard and text has been printed on the mount, above and below the image. There is a stamp on the back of the mount. Above the drawing is printed text 'Engine by Messrs Boulton & Watt, of Soho, Birmingham', and below is printed 'Erected for Messrs Whitbread & Co, 1785, as of thirty-five horse power. Altered in 1795 and increased in power. Removed 1887.' Handwritten below this 'Presented to Professor Liversidge for the Tech Mus Syd, Dec 1887'. Around the edge of the oval stamp on the back of the mount 'THE TECHNOLOGICAL / INDUSTRIAL / AND SANITARY / MUSEUM OF NEW SOUTH WALES' and in the centre of the stamp 'APR 21 1888'. There is no signature on the drawing. It would have been produced in London after the 1830s, when the engine reached its final form. The photograph was probably taken in the 1880s in order to produce multiple copies from the drawing. The drawing would probably have been commissioned by Whitbread & Co. The photograph was owned by Whitbread & Company between approximately 1880 and 1887. The company gave it to Professor Archibald Liversidge, in his role as Trustee of the Technological, Industrial and Sanitary Museum, at the same time as it donated the engine to the Museum.